Our cattery has drastically reduced in size over the last 2 years and we are now down to just 2 breeders. If you would like to adopt one of our precious kittens, it's best to get on our waiting list as soon as possible so you won't miss out on your chance. Ms Giselle is quite the little sweetheart! She was born here at our cattery on June 23rd, 2013. She is so very special and our only exotic shorthair mama! She has been the most loving baby girl from the time she was born. Her babies share her same wonderful personality and are a joy to be around. 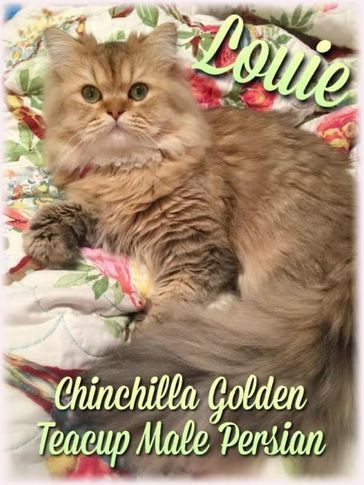 When bred to our longhaired male Louie, Giselle has a 50/50 chance of producing shorthaired babies vs longhaired. And finally, our one and only boy, sweet and precious Louie! He is an exquisite example of our chinchilla golden coloring and every baby he sires comes out just as gorgeous as him! Louie was born here in our cattery on December 22nd, 2014.